There are not Mysteries in this World! In front of every "Mystery" stands proudly the IGNORANCE and the NAIVETY and the Queen of mobs and peoples, our STUPIDITY (all with capitals and with... helmet! ), those which with unforgiving reverence, ekstatics look to us. In an unlooted burial monument, 3500 year old (KV 62, "Tutankhamuns Tomb"), from the Valley of the Kings of Pharaonic Egypt, at tomb with the three, the one into the others valuable coffins of a lame Pharaoh, observe, at the entrance, the intact seal from rope and clay and read the inscriptions on its doors and on the seal. 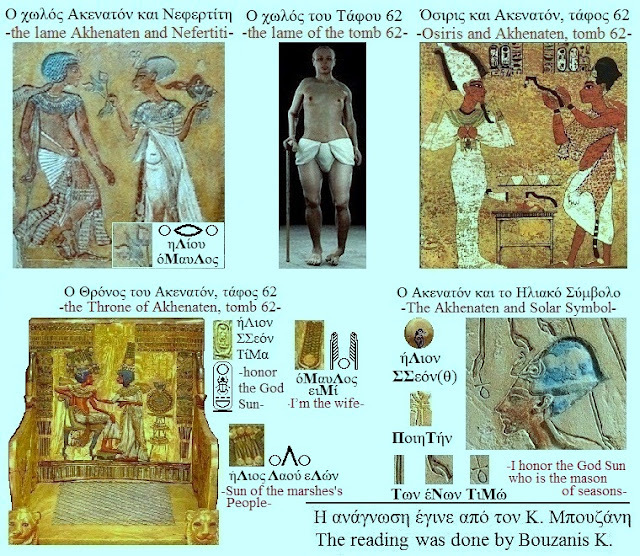 We will get from Manethon (3rd century BC) the nomenclature of the two pharaoh of our subject, and from The Grammatical-Structural Dictionary of the Greek Common, that child of Akhenaten was Tutankhamun, and his wife of Nefertiti, while the Amenhotep or Amenophis D' or Akhenaten, a sickly nature with a strange appearance, was child pharaoch and priest of God-Savior, while the inscription "This is Akhenaten's Residence" can be read as "Tutanhaton", that is, Tutankhamun with its oldest name! 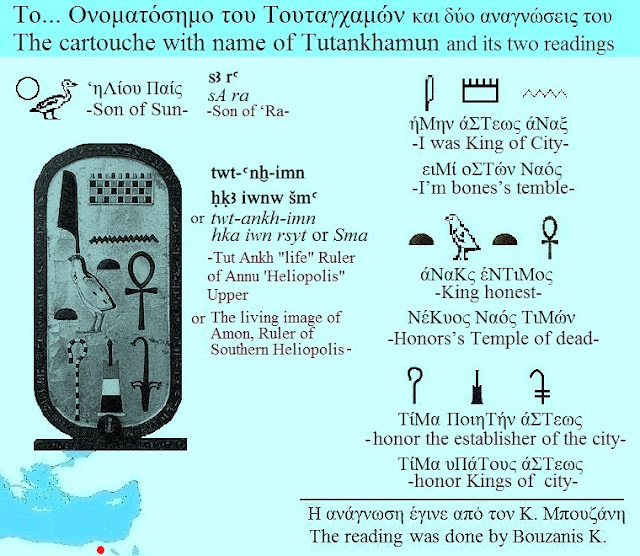 Take into consideration that the Kings in ancient times, had no names. He did not need a name for such a great lord. The ancient rulers are still circulating with the names they themselves had chosen or their palace flatterers or the historians! Really, if you happened to listen to it, why are they looking for Nefertiti at the Grave Monument 62 (of Tutankhamun, as they say!) and not in the Grave Monument 55, which they speculate to be of the Akhenaten? They know something or something does not... come out? For what reasons someone, from the sarcophagus of Tomb 55, that is supposed to belong of Akhenaten, and apparently it were not plundered, destroyed the Pharaonic symbols, and, most importantly, destroyed the spot that could reveal the identity of its inhabitant? We, here, will seek the royal wife Nefertiti and with guide our suspicion and our observations, having our ally the "Common World System of Inscription and Reading of the Ancient World", we will seek, also, the Lord God-the Lord, the Akhenaten, from the his available photographs, the utensils of his everyday life, and the ritual burial-utensils bearing his stamp-identity. A royal wife follows her husband and not her son or her husband's son. Tomb 62, regardless of who is now a guest in his royal reliquary, belongs to Akhenaten! The presence of Nefertites in the depictions of the performances with the after-death wanderings of the Soul strengthens the rationale of those who seek her here, but it leaves exposed those who... they donated this tomb to Tutankhamun! The royal dead of Tomb 62 was, indeed, lame! The countless royal sticks, amongst the many useful utensils of his everyday life that accompany him in his afterlife, and the photo like as the today Science depicts him, not is leaving room for any doubt. However, because we do not know Tutankhamun's health problems from other sources, we will be shouting that we have discovered the luxurious tomb of a pharaoh, but it is to investigate who he belongs to! 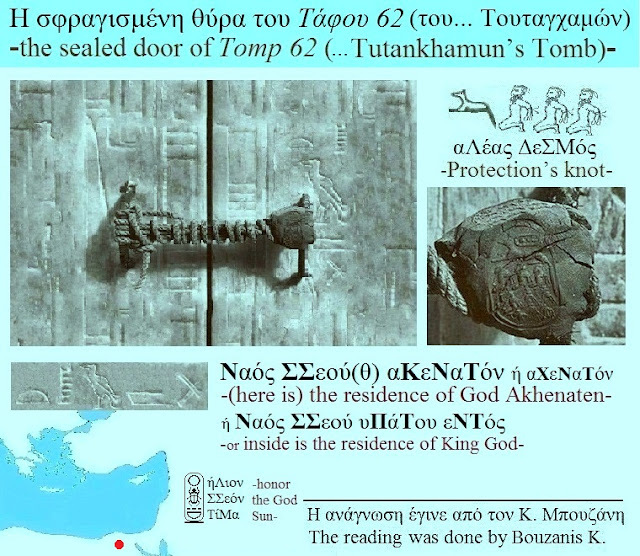 We will look carefully at the Throne of Tomb 62. Indeed, to whom do you think this throne belonged? Tutankhamun may have inherited him, and there was no reason to places it in his father's grave and so we found it in his own grave! We do not know this, and it is not critical to look at it now. We will look carefully at the Throne of Tomb 62, where Nefertiti (the Pharaoh-Sun's wife(1)) opposite to Akenaton (the Sun of the People of Nile's marshes(2)), in front of the Symbol of Solar Deity(3) and we will seek to get the seal and the elements that mark the identity of the Pharaoh. Notice another independent photograph where Nefertiti declares όΜαυΛος-wife(4) of the Sun-Akhenaten, who is supported by a stick! It is incredible! Akhenaten was lame! Nature weak with strange appearance, the Akhenaten. The misfortune for Akhenaten was that, at first was discovered the Tomb 62, a tomb of a lame Pharaoh, which, with the help of the... enlightened juggling students of Jean-Francois Champolion, was certified as "The Tutankhamun's Tomb" and then this photo and the Tomb 62 came to light! 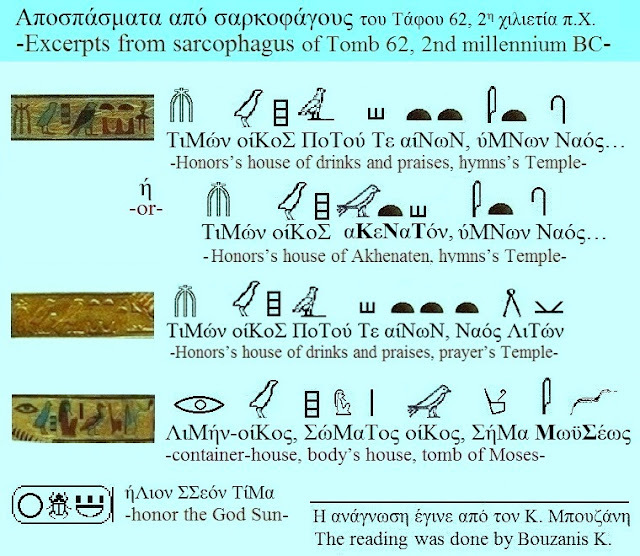 We should not omit to ask and keep the answers from some extracts from the sarcophagi of Tomb 62. The burial monument 62 belongs to Tutankhamun, as archeology of the 20th century admitted, or to Akhenaten, the husband of Nefertiti? It is not excluded it can belongs to both, as long as the son and successor of a pharaoh, pharaoch after, is buried in his father's funerary monument. In this case, the Tomb belongs to Akhenaten and rightly they are looking for Nefertiti there and there or somewhere else we should look for a totally unknown Tutankhamun! Does the mummy of "Tomb 62" belong to Tutankhamun, the Akenaten's child, or to Akhenaten himself? The answer, provided that the age of death of each, is presumed, is yours! But we have time for one last glance at the main hall of Tomb 62. The... misfortune for Akhenaten was that when Tomb 62 was discovered, that of a lame Pharaoh, with the help of... enlightened students of a Jean-Francois Champolion, was certified as "Tutankhamun's Tomb" and the curse of this tomb, the misery of the Egyptologists of the 20th century, now, the end of the absurdity, on beginning of 21th century, is the seeking of Nefertiti there! 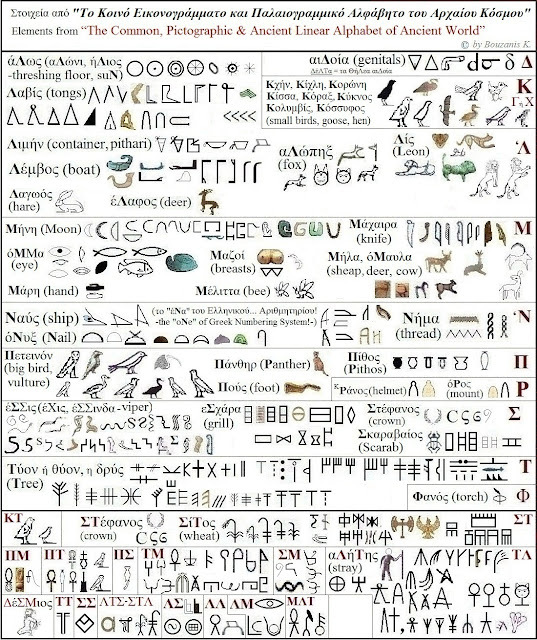 Read also, experts or not, the Pharaonic Deltus-Nomenclature of "Tutankhamun", which follows, written with Eikonogrammaton & Palaeogrammikon System of Writing-Reading of the Ancient World! With torch the greek, the primitive of the Peoples of the Sea, the Liberator Logos, we will break the dark veil of the Goddess of forgetfulness and the River of the forgetness of the ancient Mysteries, we will go through. Where the crook Man awaits the... immortal souls of... the fighters of virtue, we will bring the Light and we will enlighten the Mysteries! We will break the keys of the Big crooks of antiquity and we will free, the Old Man, from his ruthless tyrant! Walking through the tomb, we will readed and recognized persons and things related to the Ceremonies of Immortality during the path of the Soul, from death to the Isles of the Blessed, that is to the Country of the Deads. A theatrical performance, where the Death, winner of ephemeral Life, angel of Immortality and... are all there! The psychopompos Hermes, Osiris the King of the Deads, the Flow of the Nile. The Queen of Night, the Goddess of Forgetfulness, the Goddess of Sleeping and the Goddess of Punishment. The image "Ka" and the dead's dummy. Anubis the God of the Deads and Amendi-Pluto, the end of the path of the Soul. The goddess Isis, sister and wife of Osiris, as Goddess, as Mud, as goddess of wisdom, as goddess of Moon. They are all there! Beware, though! In order to approach the dark antiquity we must cross the Ancient Greek Gate. If you speak Greek, keep going.
" The CoMMon oF WRiTiNG-ReaDiNG SySTeM oF aNCieNT SPeeCH "
of the godlike Drivers-Teachers of the Human Genous. We, here, will teach Eikonogrammati & Palaeogrammiki Scripture. Αναρτήθηκε από Μπουζάνης Κων. - Bouzanis K. στις 12:15:00 π.μ.